How Obama thinks about Islam and terrorism: Why he chooses his words so carefully. He sees the connection. That’s why he chooses his words so carefully. 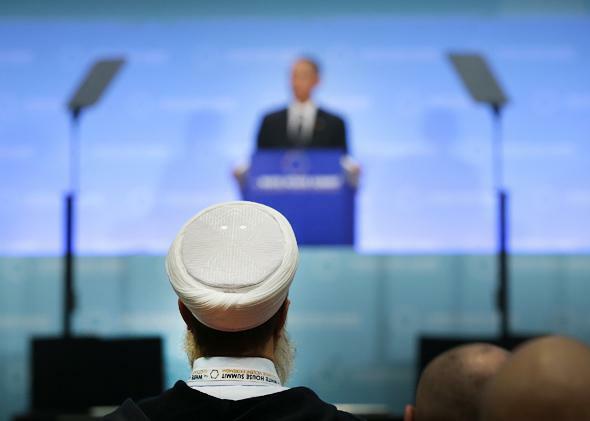 Syrian scholar and Muslim cleric Sheikh Muhammad Al-Yaqoubi listens as President Obama addresses the White House Summit on Countering Violent Extremism on Feb. 19, 2015, in Washington. What does President Obama think about Islam and terrorism? Many Republicans think he’s unable to see, or unwilling to acknowledge, that the vast majority of terrorism in recent years has been perpetrated by Muslims. This view of Obama is mistaken. There’s a difference between what he says about Islam and what he thinks about it. The difference isn’t dishonesty. It’s prudence. Obama understands that today’s terrorism is profoundly connected to the Muslim world. But the connections are manufactured and destructible. To break them, we have to deny terrorists what they want: crude associations of Islam with violence. On Wednesday and Thursday, Obama explained his thinking in two speeches at his summit on violent extremism. Here’s a translation of what he said. 1. Today’s terrorism is overwhelmingly Muslim, and its roots pervade the Muslim world. Obama didn’t say this explicitly, but his words make clear that he understands it. In both speeches, he cited the “deadly attacks in Ottawa, Sydney, Paris, and now Copenhagen.” All four attacks were by Muslims. Obama didn’t use that word in describing the attacks. But his examples tell you plenty. The more interesting pattern in Obama’s speeches is his repeated reference to the “over a billion Muslims” who reject terrorist ideology. By most estimates, there are about 1.6 billion Muslims in the world. Obama’s phrase leaves as many as half a billion Muslims unaccounted for. That’s significant, because when he wants to make an ethnic or religious group look good—as he does here—he describes the numbers as generously as he can. If he thought only a tiny fraction of Muslims were extremists, he’d say so. But that isn’t what the numbers show. According to a 2013 Pew survey, many Muslims in some countries—25 percent in Egypt, 27 percent in Malaysia, 33 percent in Lebanon, and 62 percent in the Palestinian territories—think suicide bombing against civilian targets is often or sometimes justified. Among Muslims in 11 countries, the median favorable ratings for extremist groups range from 13 percent for al-Qaida to 26 percent for Hezbollah and 32 percent for Hamas. These are the people Obama is talking about when he refers, as he did on Thursday, to a narrative of Muslim grievances against the West that “sometimes extends far beyond terrorist organizations” and “becomes the foundation upon which terrorists build their ideology.” On Wednesday, he warned against intolerant, conspiratorial, and anti-Western beliefs about the history of the Middle East. “In some communities around the world they are widespread,” he said. Obama doesn’t think the problem is just a few terrorists. He sees the ingredients for terrorism spread throughout the Muslim world. … try to portray themselves as religious leaders, holy warriors in defense of Islam. That’s why [ISIS] presumes to declare itself the “Islamic State.” And they propagate the notion that America, and the West, generally, is at war with Islam. That’s how they recruit. 3. We must choose our language to thwart the enemy’s strategy. Obama used the word narrative seven times in the two speeches. In his view, we’re not just fighting men with guns. We’re fighting a story. “When people spew hatred towards others, because of their faith or because they’re immigrants, it feeds into terrorist narratives,” he said. “If extremists are peddling the notion that Western countries are hostile to Muslims, then we need to show that we welcome people of all faiths.” In general, he argued, we “need to reject the terrorist narrative that the West and Islam are in conflict.” That’s why Obama doesn’t use the word Muslim to describe the attacks in Paris or Copenhagen. He’s depriving the enemy of rhetorical fuel. Al-Qaida and [ISIS] do draw, selectively, from the Islamic texts. They do depend upon the misperception around the world that they speak in some fashion for people of the Muslim faith, that Islam is somehow inherently violent, that there is some sort of clash of civilizations. Yes, these groups claim Islam as their foundation. Yes, they target Muslims for recruitment. But these associations are matters of political strategy and social networking. They aren’t inherently grounded in Islamic theology. And that difference is crucial. It liberates the world’s Muslims, including the hundreds of millions who share some radical views, to reject terrorism without rejecting their faith. This is why Obama, like George W. Bush, says: “We are not at war with Islam. We are at war with people who have perverted Islam.” He’s acknowledging the connection between Islam and terrorism as an artifact, not an equation. There is no one profile of a violent extremist or terrorist, so there’s no way to predict who will become radicalized. Around the world, and here in the United States, inexcusable acts of violence have been committed against people of different faiths, by people of different faiths. … It’s not unique to one group, or to one geography, or one period of time. This is the kind of talk that drives Republicans crazy. Of course there’s a profile of who’s most likely to become radicalized: young Muslim men. And Obama’s reference to some other period when some other group was committing most of the violence feels like an academic distraction from the problem at hand. You can rail at Obama for laboring so hard to avoid the obvious, or you can look at it the other way: He must be doing this for a reason. And he is. When he talks about Ottawa, Sydney, Paris, and Copenhagen without mentioning Islam, or when he delicately refers to “young people from Morocco to Malaysia,” he knows exactly what he’s doing. 8. We should talk about Muslims who fight terrorism. On Thursday, Obama praised “Muslims who have risked their lives as human shields to protect Coptic churches in Egypt and to protect Christians attending mass in Pakistan and who have tried to protect synagogues in Syria.” He exalted the Muslim policeman in Paris who died trying to stop the attack on Charlie Hebdo. He also lauded the Muslim employee who protected Jews during the kosher supermarket attack afterward. Some of Obama’s critics roll their eyes when he calls attention to such people while seeming to ignore the thousands of Muslims who have killed in Allah’s name. But statistically, he’s right that the heroes are more representative of Muslim attitudes than the villains are. He acknowledged in both speeches that he wants to “amplify” Muslim voices of peace and tolerance. Terrorist groups like al-Qaida and [ISIS] deliberately target their propaganda in the hopes of reaching and brainwashing young Muslims. … So these terrorists are a threat, first and foremost, to the communities that they target, which means communities have to take the lead in protecting themselves. And that is true here in America, as it’s true anywhere else. When someone starts getting radicalized, family and friends are often the first to see that something has changed. … Faith leaders may notice that someone is beginning to espouse violent interpretations of religion, and that’s a moment for possible intervention that allows them to … reflect on the meaning of their faith in a way that’s more consistent with peace and justice. Families and friends, co-workers, neighbors, faith leaders—they want to reach out, they want to help save their loved ones and friends, and prevent them from taking a wrong turn. This message differs significantly from the message of Obama’s critics. Obama doesn’t talk as though he’s telling Muslims to fulfill a duty they’re neglecting. His emphasis is sympathetic: Muslims have a natural interest in thwarting terrorism, because the young people targeted for recruitment are their own. Some Muslim Americans have concerns about working with government, particularly law enforcement. And their reluctance is rooted in the objection to certain practices where Muslim Americans feel they’ve been unfairly targeted. So in our work, we have to make sure that abuses stop. … Engagement with communities can’t be a cover for surveillance. We can’t “securitize” our relationship with Muslim Americans, dealing with them solely through the prism of law enforcement. Because when we do, that only reinforces suspicions, makes it harder for us to build the trust that we need to work together. That’s how Obama thinks about terrorism and Islam. He sees the connections but chooses to be careful in how he talks about them. If his language isn’t as blunt as yours, maybe that’s not because you’re more clearheaded about the threat or more courageous in facing it. Maybe he has good reasons, and you should listen to them.